Pierre Rode was the star pupil of Viotti (the greatest violinist of the day), in time becoming the leading exponent of the French Violin School. A great virtuoso � he premi�red Beethoven�s last Violin Sonata � he composed exclusively for his own instrument, and his thirteen concertos, along with his Caprices, are his greatest compositional legacy. The Violin Concerto No.2 is notable for its contrasts between challenging virtuosity and lyrical interludes, whilst Concerto No.8 is one of his most beautiful works, with long-breathed melodies and dramatic flourishes. This is the fourth of five volumes containing all thirteen of Rode�s Violin Concertos. Born in M�nster in 1971, Friedemann Eichhorn is one of the most versatile artists of his generation. He has made several world premi�re recordings, including duos for violin and cello by Fran�ois Servais, Friedrich Hermann, Fran�ois Schubert, Friedrich Kummer (with Alexander H�lshoff) and works by Arnold Mendelssohn and the Reger pupil Johanna Senfter. 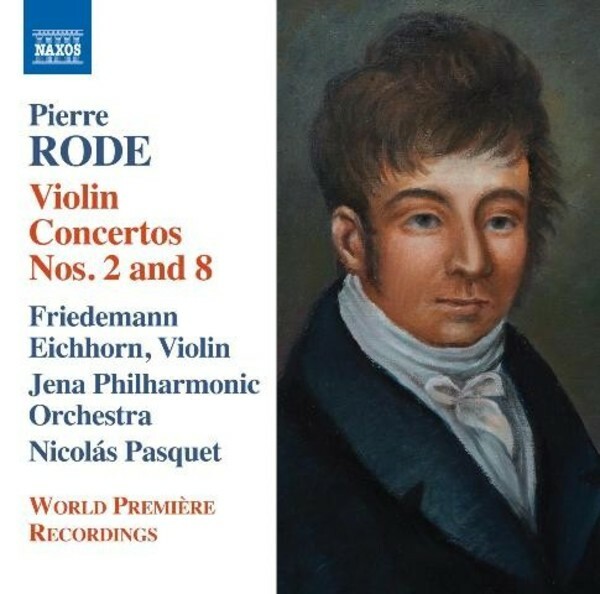 His recordings of Violin Concertos by Pierre Rode have been received with great acclaim. A professor at the Liszt School of Music in Weimar, Friedemann Eichhorn regularly gives master-classes at the Salzburg Mozarteum and is director of the International Louis Spohr Competition.